"57 Marketing Techniques Proven To Boost Your Bottom Line in 6 Weeks or Less!" Practical advice on what works in direct response marketing. Copywriting techniques proven to boost your marketing campaign results. Business development strategies you can use to land and retain high-value clients. 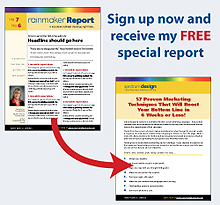 Enter your contact information here and get your copy of this FREE special report now. Has time ever gotten away from you when you were working on a project and you thought,"if only I could find a little help I could get this thing done on time?" Well I've sure been in this position. To bail both of us out the next time this happens I thought I would pull together a list of vendors that could help us. Just click on the category on the list at the left and you will be taken to a list of people you can contact. I've used some of these vendors, but not all of them. And of course I can’t endorse these vendors or accept any legal liability relating to the products or services they provide you, but they may be able to bail you out in a pinch. If you want to add a vendor to this list, send me an email with the contact information and I will add them to the list. Leading Edge Products & Services, Inc.
Website: www.leadingedgepands.com This company can get mail order catalogs to carry your product. CoReg360, a subsidiary of MarketModels, Inc.
Pop-Ups - the Pop Card Company, Inc.
Levine Sullivan & Koch, L.L.P. Eagle Printings and Mailing, Inc.
LLM List Locators & Managers, Inc.
Dunhill International List Co. Inc.
404 S. MLK Jr. Ave.
G.J. Whalen & Company, Inc.
Amanda G. Watlington, Ph.D., A.P.R. Dave Boufford & Associates, Inc.